No-touch dispensing technology has been a great advance in the hand hygiene category – and this technology has been successfully applied to every facet of hand washing, from hand towel dispensers to faucets to hand soap dispensers. Benefits of No-Touch Dispensers – What’s Not To Like? So with all of these benefits, why aren’t no-touch dispensers in every restroom? One of the primary reasons no-touch dispensers aren’t placed in every restroom – and one of the downsides typically referenced in facilities which do have no-touch dispensers installed – is related to battery maintenance. The reality is that batteries do wear out over time. Replacing a battery for a single dispenser every once in a while doesn’t seem like that much of a burden. But if a facility has hundreds or even thousands of dispensers, it can become time consuming and costly to change every single battery out when needed. As a result, many facilities with no-touch dispensers either change out batteries proactively in order to ensure that service is not interrupted, or they change out batteries reactively when they wear out. Even though the benefits of a no-touch dispensing system outweigh the hassles for most facility decision makers, when you factor in the replacement time, battery cost and battery disposal it does make you wonder if there could be a better way. The new WAXIE Select™ NRG™ No-Touch Foam Handwash Dispensing System is now available with a new breakthrough technology – battery-on-the-refill technology. What Does “Battery-On-The-Refill” Technology Mean? Battery-on-the-refill technology means that each time a soap refill is replaced, a fresh new battery is included. Each new refill comes with its own energy source, a coin cell battery that’s integrated into the refill! When the empty soap refill is replaced, fresh new soap product and fresh new energy is added with one simple step. In other words, the WAXIE Select™ NRG™ No-Touch Foam Handwash Dispensing System eliminates the hassle of either proactively or reactively changing out dispenser batteries by combining this activity with one your staff is already doing – replacing empty refills. In addition, backup power inside the dispenser provides added assurance that the soap dispenser will continue to perform at a high level over time, even with extreme high frequency usage. Once the refill is empty, the PET bottle and refill components are easy to disassemble and recycle – including the battery! 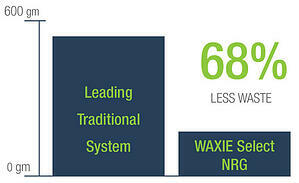 And in addition to offering improved operational efficiencies, battery-on-the-refill technology also decreases battery waste – the WAXIE Select™ NRG™ No-Touch Foam Handwash Dispensing System represents a 68% reduction in battery waste* when compared to leading no-touch systems on the market! * This 68% reduction in battery waste is based on battery weight at a usage rate of three refills per dispenser per year, with savings calculated based on a 6-year dispenser lifetime. If you’re interested in learning more about this exciting new breakthrough technology in no-touch dispensing, please contact your WAXIE Account Consultant. Let us help you build your custom hand hygiene solution today!